After an objection was filed Vexatious wins the Rood and Riddle Dowager (GIII), Forent Geroux up, trained by Neil Drysdale and owned by Calumet Farm. Calumet Farm's Vexatious, who finished a neck behind Beach Flower, was elevated to first place on the disqualification of Beach Flower for interference in the stretch to win the 27th running of the $125,000 Rood & Riddle Dowager (G3) for fillies and mares before a Sunday afternoon crowd of 13,836 at Keeneland. Trained by Neil Drysdale and ridden by Florent Geroux, Vexatious notched the first graded stakes victory of her career. The victory marked Drysdale's 10th stakes triumph at Keeneland and first since 2002. It was the first victory in the race for Drysdale and Geroux. The 1½-mile race was run over a firm turf course in 2:32.40. Beach Flower, ridden by Chris Landeros, led the field of nine through fractions of :25.26, :50.69, 1:15.91 and 1:41.22 with Daring Duchess in closest pursuit and Vexatious maintaining position along the rail. In the stretch, Beach Flower refused to yield the lead as Vexatious challenged on the outside and English Affair made a bold move along the rail. English Affair was in tight against the rail inside the eighth pole and again in deep stretch where she had to steady prompting a claim of foul by Brian Hernandez Jr. against the winner for the infraction. The claim was upheld by the stewards after review. The victory was worth $75,000 and increased the bankroll of Vexatious to $309,525 with a record of 13-3-0-5. A Keeneland sales graduate, Vexatious is a 4-year-old daughter of Giant's Causeway out of the Siberian Summer mare Dream of Summer. Vexatious returned $10.60, $5 and $4. English Affair, also owned by Calumet Farm, returned $7.20 and $5.40 with Beach Flower paying $6 to show. Favored Res Ipsa finished another head back in fourth and was followed in order by Amboseli, Savannah Belle, Daring Duchess, Shezaprado and Viva Vegas. The final week of racing kicks off Wednesday afternoon with an eight-race program beginning at 1:05 ET. The 17-day meet concludes Saturday, Oct. 27. 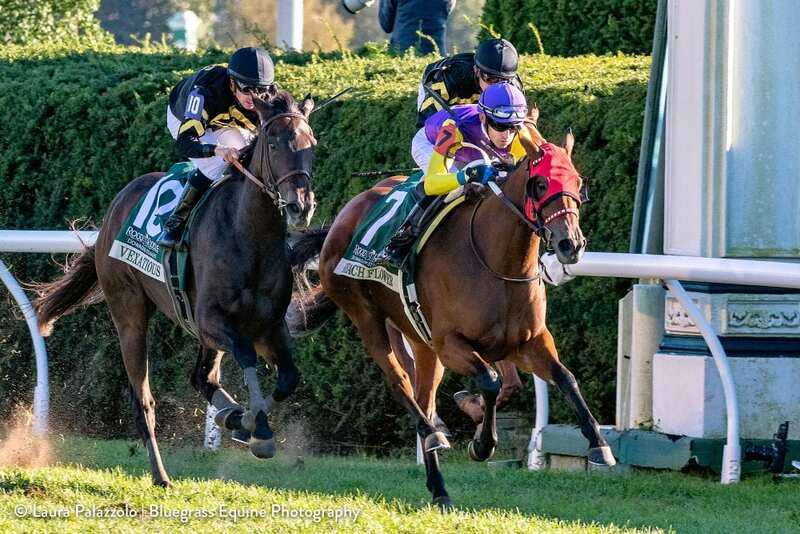 This entry was posted in Racing and tagged beach flower, brian hernandez, Calumet, Calumet Farm, chris landeros, dowager, Florent Geroux, Keeneland, neil drysdale, vexatious by Press Release. Bookmark the permalink.